In the midst of our preparation to go to Thailand and Hong Kong, we decided to throw a Special Fork party to thank the people who have helped us develop the beta version of our mobile website. David, my son, co-founder and CEO of Special Fork, wants to build a company with good values – one that appreciates the contributions of the people who help us succeed, and when we are successful, to compensate them equitably. So we threw an after-work thank you party for the Web developers, photographer, business consultants and Special Fork food editors. David and I did all the cooking over two days, selecting appetizers from the Special Fork beta site. 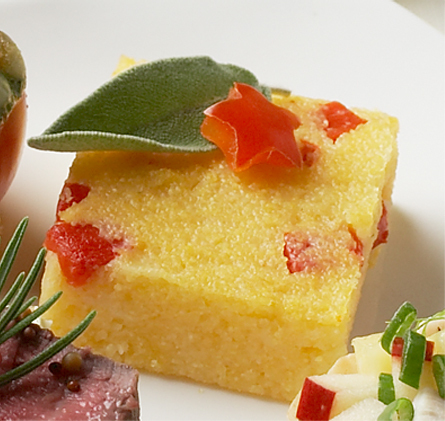 We created a menu to reflect a variety of flavors, textures and colors. We balanced make-ahead recipes with those that required last-minute preparation. We downloaded the recipe ingredients to our Special Fork shopping list and off we went to the supermarket. Cooking together is no problem in our large, open kitchen (our kitchen is pictured on our blog masthead). We just each staked out a section of the butcher block to prep and shared burners on the six-burner Wolf range. Since eye appeal is as important as the taste of food, I always take time to plan the table setting, selecting which platter or bowl to use for each dish. I set these out in advance to ensure that the disparate dishes will look harmonious on the table and so I’m not scrambling for a serving dish at the last minute. In the summer, I love sunflowers as the table centerpiece. They’re bright, cheerful and remind me of leisurely drives through the south of France, past field upon field of gold, each flower raised up to the warmth of the sun. I put the sunflowers together Martha Stewart style, arranging the heads in my hand, then bundling the stems with raffia, trimming the bottoms to fit the vase. Here are some of the dishes we made. These and all the rest will be available on the Special Fork mobile website when we launch this fall. 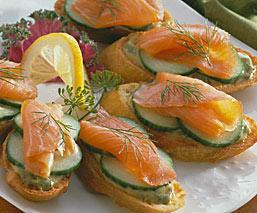 This recipe, from the National Fisheries Institute, gives smoked salmon a Scandinavian flair. We quadrupled the recipe and served cucumber, mustard and salmon in separate dishes for guests to assemble. We also used dark pumpernickel squares instead of making the crostini. It took us minutes to prepare. Combine 16 sliced English cucumber and 2 tablespoons rice vinegar in a small bowl; set aside. Combine 2 tablespoons chopped fresh dill, 1 tablespoon sugar and 3 tablespoons Dijon mustard in small bowl; mix well. Heat broiler. Brush 16 thin slices French bread with 2 tablespoons olive oil on both sides; place on broiler pan. Broil until lightly browned on both sides, about 2 to 3 minutes, turning once. Spread about 1 teaspoon mustard mixture on toasted bread slices, top with 2 cucumber slices. Cut 8 slices (3 oz.) cold-smoked salmon in half. Put 1 slice on each. Garnish with additional fresh dill. Makes 16 appetizers. This is a super-easy, make-ahead recipe from one of our Special Fork sponsors, the Irish Dairy Board/Kerrygold. To cut perfect squares, make a cardboard strip 2 inches wide and cover with foil to use as a guide. Butter a 13- X 9-inch baking dish. In medium saucepan, bring 4 cups low-sodium chicken broth and ¼ cup Kerrygold Butter to boil. Add 1 cup polenta; cook and stir over low heat 10 minutes. Add 2 cloves minced garlic, 7 ounces shredded Kerrygold Dubliner Cheese, ½ cup minced roasted red bell pepper, 1 tablespoon minced fresh sage and pepper to taste and cook 5 minutes more. Pour into baking dish and chill at least 1 hour. Cut into 2-inch squares or diamonds. Serve at room temperature or grill a minute or two on each side. Makes 24 appetizers (you’ll have an inch strip on each side for tasting).